It’s a weird world out there as December 2012 heads to a close, but this week at DOTW Central our theme is holiday bounty. An example of that would be the bounteous bottle of Carpano Antica I received from a mysterious publicity benefactor late last week. For those not in the know about this sweet vermouth with a more complex, dark chocolate-like undercurrent, it’s become increasingly ubiquitous in the craft and classic cocktail scene. Some may find it more bitter than sweet, and its growing popularity probably says something about us cocktail snobs, which is not to say it isn’t completely tasty all on its own. Carpano made a guest appearance in last week’s beverage where it actually kind of saved the day with its not so hidden depths. More about it later. And what better drink to celebrate holiday and the benevolence of whatever cosmic powers you may or may not believe in than the Jumbo, a drink comprised of a trinity of historically benevolent boozes? Better yet, while last year’s more traditional Christmas cocktail threatened to make me jumbo — I’m not exactly microscopic right now — today’s drink is relatively quite low cal and 100% fat free. It’s also super easy to make and even easier to memorize the ingredients and proportions. So, hooray for all that. Combine the liquids in the most festive cocktail shaker or mixing glass you can find and then either shake or stir — I’m feeling ecumenical this week but I’d still shake it — for a good long time. Then, strain into ye olde chilled cocktail glass and garnish with a cherry. If you’re a cheapskate like me, it’s likely to resemble Santa’s nose but, I have to admit, it will taste better if it looks more like, well, a black cherry. Sip in honor of a great holiday and, let’s hope, a better new year. I actually tried this drink with two different vermouths and got two fascinating and kind of delightful results. With Carpano Antica, it was a not-so-sweet but charming drink with a rich, deep undercurrent.With Martini & Rossi, the universal fall-back sweet and not at all bitter vermouth, it was light and enjoyable — your basic good natured, cocktail treat. A more easy going Manhattan. I actually think both versions are perfectly legitimate and, in their way, almost entirely different drinks. Just another testament to the infinite variability of cocktails. My rye this time, by the way, was the new Knob Creek rye, which I’ve been really enjoying. 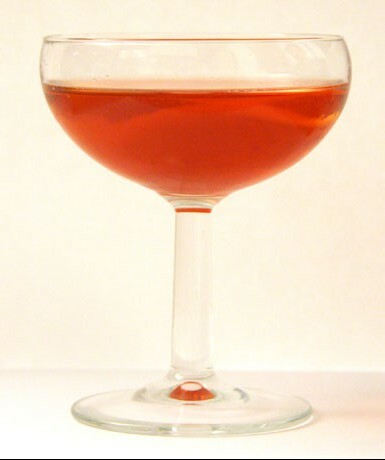 Speaking of ingredients, I once again need to speak up for bitters, in this case Peychaud’s. I mistakenly got the idea from something I read somewhere that at least some people made the Jumbo without bitters. And, so, I made versions of this that were completely bitter free and it was, well, a pale experience. Let me tell you folks, while Angostura/aromatic type bitters will do okay in a pinch, it really takes the lighter and more cheerful Peychaud’s to make the Jumbo sing. Also, I found out, just as this was being posted, that some folks go with a bit more whiskey and dry vermouth and a bit less of the sweet vermouth, so if you find these versions too sweet, feel free to try out a drier Jumbo. Finally, since the holiday is almost upon us, let’s end with a song. Remember, folks, only three drinking days left until even more drinking days. One singer is gone and the other is still with us and it’s not who anyone would have guessed. Life and death are beyond predictability; we don’t have a choice about that, but that’s also all the more reason to cherish life. On the other hand, that doesn’t mean you have to necessarily overdo it, at least not most of the time. A couple of years back I was in a restaurant bar in L.A.’s Chinatown known for it’s Tiki-style specialties. Not sure what to order, I asked the bartender, an older gentlemen who clearly knew what was what in that venerable Asian-American enclave, what cocktail he liked most to make. “Beer,” he told me, utterly straightfaced. Forget it, Bob, it’s, well, you know where. In my experience, most bartenders aren’t really big on offering up suggestions that go beyond the best known drinks. That leaves it up to more adventurous imbibers to suggest something a bit different. The only problem is that it’s kind of hard to remember the ingredients and exact proportions of most great cocktails. Not so with today’s slightly unusual but also highly symmetrical dual-spirit concoction. If you can remember “equal parts brandy, rye, and sweet vermouth and bitters” you’ve got this drink mostly down. My Good Friday 2012 drink is also about as classic as they come. It dates back to 1887 and the second of Jerry Thomas’s seminal 19th century cocktail guides. The name, I gather, comes from Saratoga Springs in Upstate New York. Once upon a time, the town combined spa-like resorts, natural beauty, and also a healthy business in gambling, and not only at the famed race track. 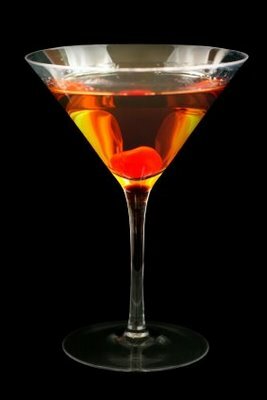 In any case, the drink is an outstanding variation on the Manhattan and so simple even the most distracted and busy bartender should be able to manage it — well, assuming the bar even stocks rye. Stop me if you’ve heard this one before. Combine the rye, brandy, vermouth and a dash of two of bitters in a cocktail shaker with lots of ice. Stir or shake it vigorously, and strain the results into a chilled cocktail glass, preferably with the lemon wheel already sitting it in it — not perched on the side of the glass. Sip and contemplate how much harder it must have been to get a hold of the large quantities of ice necessary for good cocktails in 1887. I used Rittenhouse Rye which, being 100 proof, stands up really well to the combined sweetness of my beloved Noilly Pratt red vermouth and the wonderfully value priced Reynal brandy. I found the lemon slice to be an essential component. It’s one garnish that really does kind of make the drink, for me anyway. You might also want to give lemon peel/zest a try. I did do a little experimenting. At the suggestion of a 2009 post on the Alcademics blog, I tried it with some Scotch (the Glenrothes). It was nice, but not quite as nice as with rye. I also tried it with some very good bourbon (Buffalo Trace) which was, however, a bust as bourbon is probably about as sweet as brandy.